Concise meaning - The agony of Bhakta Ramadas is reflected in this keertana. 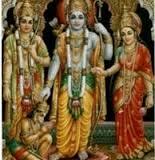 Sri Rama is referred as Kodandapani (the wielder of bow) in this song. Ramadasu questions Rama why He (Rama) is not answering to his (Ramadasu) prayers though he (Ramadas) did not forget to chant His (Rama) name in his (Ramadasu) dreams? Concise meaning - Ramadasu says why Rama is not showing mercy on him in spite of his repeated requests. He (Ramadasu) mentions that he is an ordinary man and how can he show his stubbornness with god. Concise meaning - Ramadasu says that how can he believe that Rama was merciful to the small creature / squirrel which showed its devotion by carrying sand particles on its body and thus helping in the construction of bridge (Ram Setu). Concise meaning - And finally Ramadasu says to Rama that prove Himself as the merciful one by having mercy on him (Ramadasu) - His servant. The concluding stanza of all the Ramadasu keertanas include his name.